Chaplain Dagon the Wroth, had led men in thousands of campaigns and had seen all manner of horrors on the battlefield. Friendly fire was an unfortunate reality of war, but this was different. The Blood Angels that had been holding his left flank were now pouring fire into his troops. Without hesitation he ordered the servitors operating the teleportation beacons to reposition himself and a nearby unit of Razorclaw-armed Terminators behind the Blood Angel line. In a flash he was amongst his red-clad brothers, but all was not as it should be. They were laying down a concerted fire on his own troops. He barked at them to desist, but soon came under small arms fire. This would not be settled with words. Cassius hurled himself towards the traitors. A blur of skulls, razor sharp claws and his fallen lord swam in his mind. The Charcarodons deserved his wrath for their treachery. They had killed Sanguinus… Bolt rounds and the sounds of battle filled the air as Cassius found himself fighting enemy Terminators while barking guttural orders at his own heavily armored warriors. They were to hold up the skull-faced Horus until he could join them. A Leviathan class Dreadnought powered towards the Blood Angel’s line, plasma fire and psychic blasts damaging its massive chassis. They were not enough to halt its horrendous momentum before it smashed aside a unit of Intercessors like a child’s playthings. Just as it was about to strike down upon him Santorius summoned all he could from the Warp, felling the giant in a miasmic maelstrom, but the backlash drove him to his knees. As he rose he surveyed his brethren. The fighting was desperate and the Charcarodons were besting his brothers. He did not see the treachery that Cassius was so convinced of. Cassius’ hammer fell again and again in bloody revelry. The enemy Terminators had taken two squads of his brothers, but his retribution was merciless, killing all who resisted him. Their connection to the rest of the Blood Angels was in danger of being cut off, but he did not care. Sanguinius would guide him. An enemy Lascannon-armed Razorback sped past him, overrunning the position they had advanced from and he barely dodged a brutal blow from the Warmaster. “We must fall back or all of our brothers will be lost”. It was Santorius’ voice over the vox, but it was out of place here on the Vengeful Spirit. Cassius’ head spun. Blows from powerfists hailed down on Dagon, his ancient armour crumpling under the extreme force. He felt bones snap and organs rupture. He was ready. This is what he was created for, to die fighting the Emperor’s wars. Holy litanies whispered from his lips as he closed his eyes. If he was to die at the hands of fallen brothers, so be it. The world went quiet and he opened his eyes. With immense pain he pulled himself to a standing position. The treacherous Blood Angels had retreated. He opened a vox channel to Tyberos, “Lord, we have a problem…”. The Ruse didn’t come into play as my Warlord survived, despite his foolhardy charge into a full unit of Terminators. Thankfully the acid rain also stopped after first round. 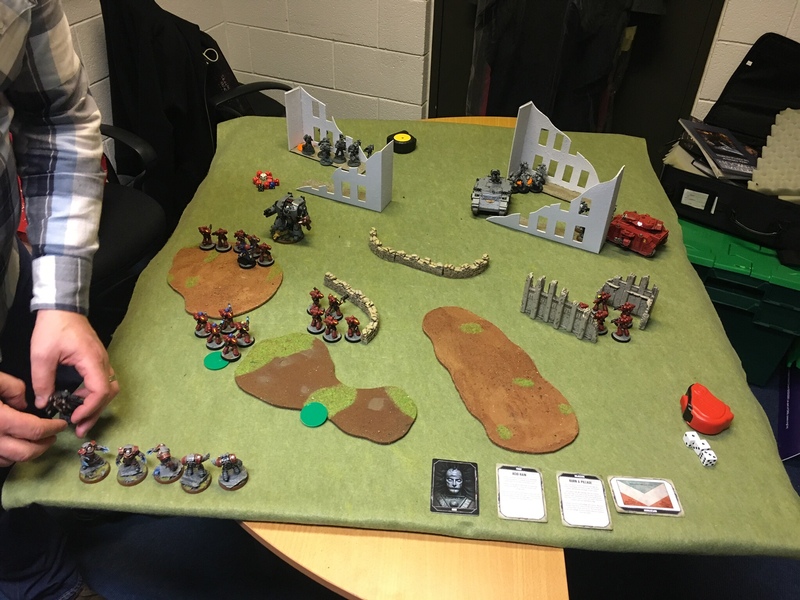 I completely goofed and left by objectives open to Graham’s deepstriking Terminators, but he was gracious enough to allow me to reposition one so the game didn’t end after one battle round! It was quite a bloody game, but again I left my objective open and Graham’s Razorback was able to advance rapidly on it. I’ll blame the few beers for my sloppy play. It was a fun game with the win solidly going to Graham’s Charcarodons. 61-64: Fated – The Character makes a full recovery and is available to participate in the next game. Additionally, for the next time when a friendly unit within 12” of the Character suffers a Mortal Wound roll a D6, the Mortal Wound is ignored on a 6. I expect Tyberos will task this Fated Chaplain with hunting down the wayward Cassius.